Q: Why Do Cats Drink Water Off Their Paws? A: Because it's more comfortable for them. A number of cats have been known to dunk their paws in a glass or bowl of water and then proceed to lick the moisture, instead of lowering their heads to lap some water with their tongues. 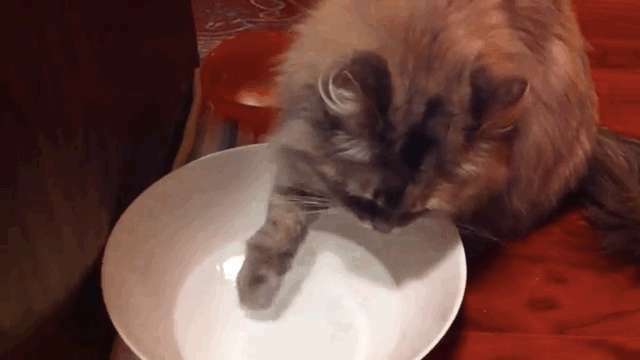 This behavior, says feline expert Mikel Delgado, is usually a matter of personal preference: just like humans may prefer to drink their water with ice or without, some cats just prefer to lick water from their paws. "Cats can form preferences at a young age, and so this behavior is not necessarily even related to the cat's current water set up," Delgado said. "Some cats may prefer licking their paws to drinking out of a water bowl if they don't like the shape of the water bowl. Cats are subject to ‘whisker stress' where they may not like pressure on their whiskers while they eat or drink. It could also be because the water level isn't quite what they would like it to be -- it's usually too low." But many cats may just see water as more than a source of hydration; it's a way to have some fun. "Some cats may just like to play in their water," Delgado explained. "Some are also attracted to moving water, so perhaps moving it themselves -- and making ripples in the bowl -- makes the water more interesting!"